I love bread, especially homemade bread, but I don't always have the time to bake it! Unfortunately, some days, by the time I decide I'd like to have a batch of homemade rolls or a loaf of bread to go along with dinner, it's too late in the day to wait for the bread to rise and bake it. 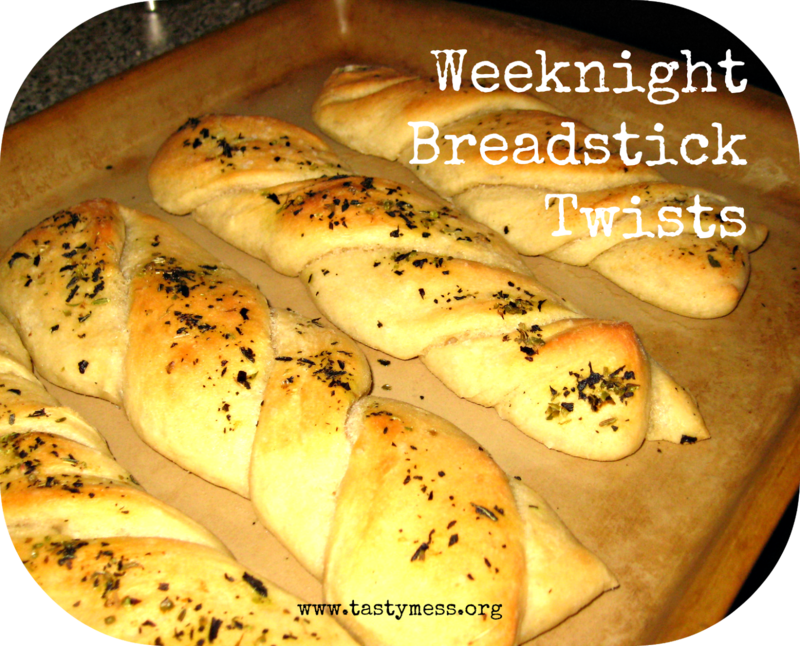 I came across this recipe for breadstick twists and was amazed at how quickly they could rise and be ready for baking - less than and hour, could that really work? They turned out perfectly and are definitely going into my regular arsenal for bread, they were perfect alongside the Beef Minestrone Soup I'll be sharing tomorrow, so make sure to check the site tomorrow morning for the recipe! I always like to "proof" my yeast first to make sure it isn't dead and I don't end up with sad bread that doesn't rise well. Add yeast and water to the bowl of your stand mixer. Sprinkle in the sugar and let it sit for 5 minutes. If it foams and bubbles up your yeast is good to go! Use the dough hook attachment on your mixer and stir in 2 cups of the flour and let it sit another 5 minutes before adding in the salt and rest of the flour 1/2 a cup at a time until you have a soft, slightly sticky and elastic dough. Spray a large bowl (I like to use glass) with nonstick spray and place the dough inside, covering lightly with a greased piece of plastic wrap. Set in a warm place (like on top of a 200 degree oven if its cold in your home) and let it rise for 20-30 minutes. Gently roll/pat the dough out on a floured surface until you have a large rectangle shape. Cut the dough into 1" strips, fold each strip in half and twist together, placing on a lightly greased cookie sheet. Brush the twists with the melted butter and sprinkle with garlic powder and Italian seasoning blend. Bake at 375 degrees for 20-30 minutes until lightly browned.